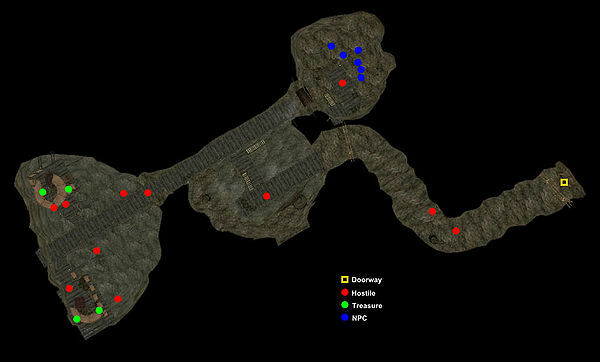 This place page is currently being rewritten as part of the Morrowind Overhaul Project. The page is being rewritten and checked in several stages. All users are welcome to make changes to the page. If you make a change that is relevant to the project, please update this template accordingly, and make sure you have observed the project guidelines. 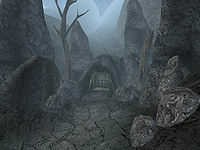 Saturan is a small bandit cave located over the hills to the northeast of Suran. An easy way to find it is by going to the Suran silt strider and heading due east. If you don't have Levitate or good Acrobatics, you may have to walk south around the hills. The local Hlaalu noble, Serjo Avon Oran, has hired the Fighters Guild of Ald'ruhn to clear out the bandits living there; evidently, he does not trust the more local Fighters Guild branches in Balmora or Vivec to do the job. Apart from raids, the bandits deal in a bit of everything; they smuggle booze, drugs, and Slaves. Aside from a couple of potions, scrolls (Scroll of Hellfire, Scroll of Summon Frost Atronach, and an urn with five random scrolls), a minor magical amulet (of Shielding), and the Axe skill book The Axe Man, all the treasure in here is random and mundane. The bandit Jolgeir carries the key if you want to free the slaves here. The agent Daldur Sarys provides medium training service in Short Blade as well as minor training for Light Armor, and Sneak if he is snuck up on or calmed. Bandits in Suran: Get rid of some bandits in Suran for Avon Oran. Nord Barbarian 13 142 80 0 90 He carries the Saturan Slave Key. *He appears to have already escaped from his slave bracer somehow, and cannot be "freed". This is presumably an error caused by the fact that he is listed mistakenly as an "Acrobat" class instead of a "Slave". This bug is fixed by the Morrowind Patch Project. The bandits mostly wear netch or chitin gear, except for Muk gro-Dula who wears bonemold and Vevos Nerethi who wears iron. This page was last modified on 8 September 2018, at 04:07.